To help meet the growing demand for genetics services amid a national shortage of genetic providers, some health systems in northeast Ohio have turned to telemedicine. Science has offered many more ways that patients can benefit from learning about their genes, and the cost of the technology has come down, helping to drive demand. "Today we have more tools, and we understand the genetics better," said Dr. Anthony Wynshaw-Boris, chair of the department of genetics and genome sciences at the Case Western Reserve University School of Medicine and head of the clinical genetic activities throughout the University Hospitals health system. University Hospitals began offering telemedicine services last year, a move that was met with enthusiasm from patients. In May, Cleveland Clinic's Center for Personalized Genetic Healthcare, the clinical arm of the system's Genomic Medicine Institute, hired Dr. David Flannery to help drastically expand its telegenetics offerings, which first began in 2016. "There's limited number of geneticists in the country, and limited number of genetic counselors in the country," said Flannery, director of telegenetics and digital genetics at Cleveland Clinic. "And the distribution of genetic providers is not very well-distributed because most of us are in academic medical centers, and patients are scattered all over." There are only about 1,600 board-certified medical geneticists who are M.D. providers in the United States. According to the National Society of Genetic Counselors, there are roughly 4,000 board-certified genetic counselors, providers who go through two years of post-undergraduate training to get a master's degree. "Expanding the workforce is something that's been a priority for genetics specialists, but it's probably going to be hard to keep up with demand," Flannery said. Growing the number of genetic providers proves to be challenging for a number of reasons. Creating a graduate program for genetic counselors is "fairly easy," Flannery said, but the challenge in M.D. training for geneticists comes with having to create and fund a residency program. Beyond educational challenges, genetics isn't the most lucrative field in medicine, so it struggles to draw interest, he said. University Hospitals has a residency program for geneticists, training between four and six geneticists per year. It also recently increased its genetic counseling training program from six to eight students per year. Wynshaw-Boris said he sees the need for geneticists and genetic counselors continuing to grow, because "the amount of new genetic knowledge is growing, and that will mean we'll have more need for services." The growth in demand for these services has been driven in part by a focus on precision medicine, as well as by offshoots of the Human Genome project, an international research effort to determine the sequence of the human genome and identify the genes that it contains. MetroHealth is also seeing a growing demand for its genetic services, but hasn't ventured into telemedicine at this point. Dr. Rocio Moran, division director of genetics and genomics at MetroHealth, said she's seen a "significant change" in the referral base in recent years. Traditionally, genetics primarily dealt with the study of rare disorders, especially those that exist in pediatrics. So most of MetroHealth's genetics patients were babies with birth defects or developmental issues, or pregnancies with anomalies noted. "As genetics and genomics really began to take its footing in medicine, we've really seen that referral base increase over the years to include adults with adult-onset conditions like cancer, cardiovascular conditions, neurologic conditions in order to try to identify the molecular cause of their medical issues," Moran said. "But we've also seen kind of an increasing wave of patients interested in wellness opportunities, so identifying genetic markers that could predispose to various things in a pre-symptomatic patient as opposed to a symptomatic patient." The last area she's seen growth in has been in the field of pharmacogenetics, or how patients metabolize various drugs based on their genetic makeup. The costs of genetics services ranges widely, Moran said, from $250 to thousands. Physician visits are often covered by insurance, but systems have found it challenging to get insurance companies to allow for billing genetic counselors' services. At Cleveland Clinic, the expansion of its genetics offerings includes setting up genetic counselors with Cleveland Clinic Express Care Online so they can virtually deliver results to patient, purchasing telehealth equipment for the main campus genetics clinic, adding virtual genetics consults for inpatients at other Cleveland Clinic hospitals and exploring the possibility of offering of outpatient telegenetics at Cleveland Clinic locations outside Ohio. The Clinic will also implement eConsults, in which a physician can contact a geneticist or genetic counselor to determine whether a patient should have a test done, rather than simply referring patients to the specialist. The system is also employing a "flipped telemedicine" model, in which geneticists in other parts of the country will see patients in Cleveland via telemedicine. So far, the Clinic has hired a geneticist in Miami and another in Detroit. "Every year, I kept saying this is the future, you know, telemedicine's the future," said Flannery, who's been working in telegenetics since the 1990s. "And it's finally reached the point where it has, and it's because the technology's not the complication anymore. 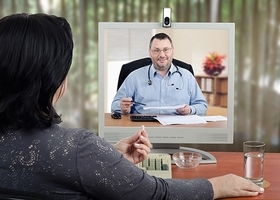 It's the human factor of getting telemedicine services organized that's the real challenge. … It's a matter of getting patients connected with providers and figuring out how to make that happen." "Telemedicine could soften geneticist shortage" originally appeared in Crain's Cleveland Business.